Object-based image analysis is used to perform crater detection. High-resolution Lunar Reconnaissance Orbiter Narrow Angle Camera images are used with a resolution of one meter per pixel. This CDA detects craters ranging from one meter to one kilometer in radius. The algorithm is implemented in eCognition, ArcMap, and Python, using segmentation and object-oriented classification procedures iterating over the scale parameter and focusing on different levels of brightness. 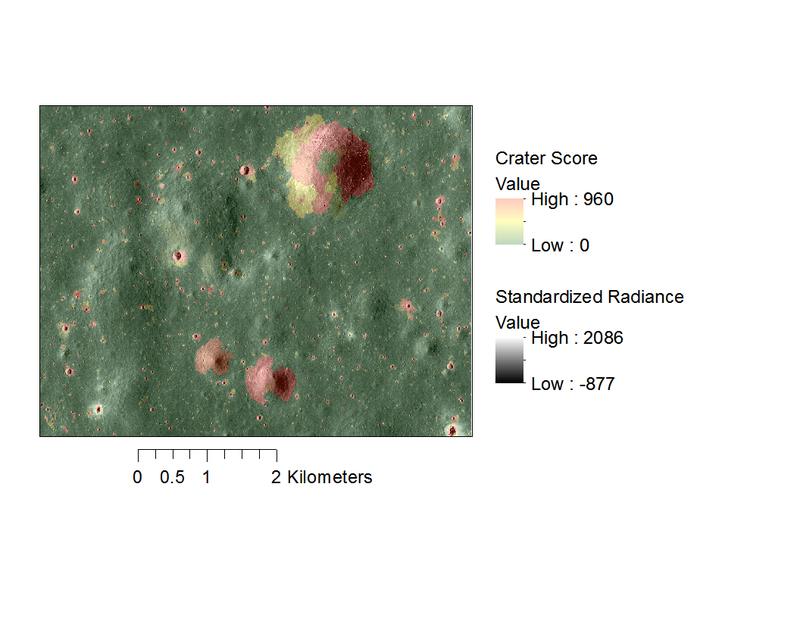 The segmentation uses high values for the shape and compactness parameters, resulting in a preference for the nearly circular shapes associated with impact craters. A three-tiered classification scheme is used which takes advantage of paired patterns of light and shadow. Although many areas in the image are determined to be illuminated or shadowed, the pairing process filters out those most likely to be craters. A quality rate of 60.11%, true detection rate of 68.88%, and false detection rate of 17.48% are achieved.